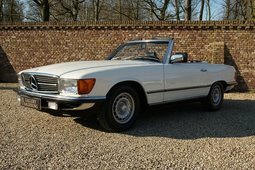 Mercedes-Benz introduced R107 and C107 in 1971 as a replacement for famous W112 ‘Pagoda’ roadster and W111 coupe. At first, the new model was offered to European buyers, with a 3.5-liter V8 and a designation of 350 SL/SLC. The following year 350 SL and 350 SLC debuted in North American market, which would later prove to be very successful step. 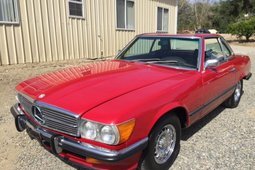 Unlike the European 350 SL/SLC, the American cars had a bigger 4.5-liter V8 with lower compression ratio to meet the stringent emission laws of USA. All of the cars sold in the US are easily distinguished by quad-headlight assembly and chunkier bumpers, which were redesigned to meet American regulations. Almost 300,000 units of these roadsters and coupes were produced over the years, two thirds of those sold in US. This generation of SL roadster was produced for surprising 18 years, whereas SLCs were manufactured only until 1981. Over the years, different engines have been offered with these cars, some European models were offered with straight six engines, but all of the American cars came equipped with a V8. 500 SL/SLC was introduced for the European market in 1980, becoming the fastest mass production version of Mercedes grand tourer, considerably quicker than all of the versions offered in the USA. Thus, many SLs and SLC with this 5.0-liter V8 ended up as grey imports in the USA, until Mercedes launched a new flagship roadster, 560 SL (5.6-liter V8) specifically for the American market. 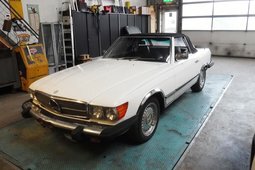 Albeit the 560 SL was the most powerful model of this generation, 450 SLC and the later 500 SLC are very sought after today, as they were produced to homologate the C107 for WRC. 2,769 units of 450/500 SLC were produced, and while production cars were detuned compared to their racing counterparts, they still featured aluminum hood, trunk lid and doors, shaving 57 kg off the curb weight. The success of this weight reduction was proven in 1978 when Mercedes-Benz entered Rally South America with European-spec 450 SLCs and won it. The cars that took on this 30,000 km rally differed very little from the production models. While they were fitted with skid pans, roll cages and additional lights, these coupes retained the production V8s and three speed automatic gearboxes. The winning Mercedes was driven by Timo Mäkinen and co-piloted by Jean Todt, the current president of FIA. 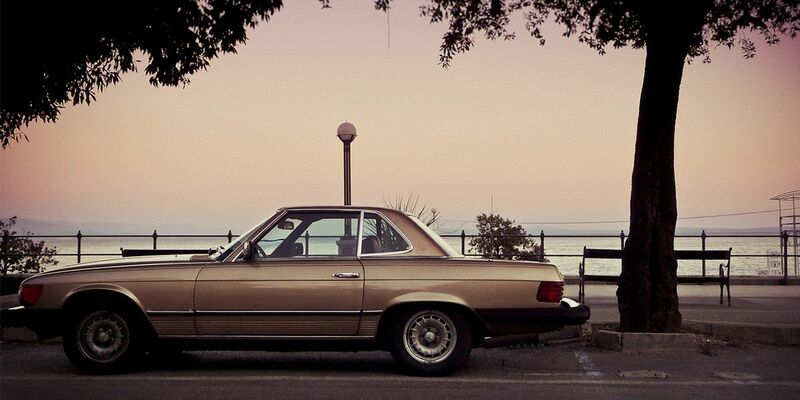 The race version of 450 SLC was later revised, by putting an aluminum block 5.0-liter V8 in it, as well as fitting plastic fender flares to house wider wheels. Mercedes-Benz entered WRC again in 1979, and 450 SLC, piloted by Hannu Mikkola finished in the second position overall. This big coupe with automatic gearbox even propelled him to the first place in the Rallye Côte d’Ivoire (Ivory Coast Rally) in the same year. The racing coupe was rebranded into 500 SLC the following year and managed to take first two podium positions in Bandama Rally in Ivory Coast. After 500 SLC finished 4th overall in 1980 season, the team started to develop a new version of the car for 1981. Unfortunately, company’s management decided to cut the funding, putting the end to C107 rally program. While the coupe was raced on a rally course, the R107 roadster made several significant appearances on the big screen. Its classic looks, trident star on the grille and convertible roof represented the good life. 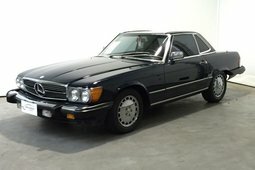 450 SL was driven by Sharon Stone in M. Scorsese’s classic “Casino”, another R107 was driven by Richard Gere when he was playing the American Gigolo. The appearances of these roadsters were not limited to big screens either – popular TV show “Dallas” featured an R107 in its intro as well as the episodes. The R107 roadster with Hollywood appeal was produced for 18 years without major changes, with around 235,000 units produced, so there are plenty to choose from these days. A decent example would probably set you back around 15,000 €, with European market models or ones with more powerful engines costing more. Although the number of SLCs is considerably lower, that doesn’t make them much more expensive. As with SLs, the prices go from 15,000 € upwards for examples that do not need major restoration.